As fans, we can love the NHL as a sport, but should never forget it’s also a business. Every NHL team has to weigh the production provided by its players versus the cost associated with that production. So too, teams have to evaluate the salaries and cap hits for certain players and determine if they are on par financially with their results. If not, the teams make trades, buyout players or make changes. Ultimately, if an NHL franchise can obtain results at a lower cost than their competition, they’re considered to have a more balanced team, a team with flexibility and a strong General Manager. The Flames have a formidable top-three group on the blue line. You can put it up against any other top-three group from any other team in the NHL and confidently say the Flames outclass their opposition when it comes to offensive production. To deploy a combination of Mark Giordano, T.J. Brodie and Dougie Hamilton means Calgary has weapons and legitimate offensive skill from the defense in. If you’re a Flames fan and you like to see scoring, it’s a nice arsenal to have at your team’s disposal. 18 other teams had their top three finish with under 106 points. Only Nashville, a team known to produce the elite of the elite in NHL defensemen, had more points offensively from their top three defensemen than did the Flames. Furthermore, only Ottawa and San Jose came close. This is pretty good company and well worth the praise and expectation thrust upon Calgary’s blue line to start the 2015-16 season. In short, offensively, the Flames didn’t disappoint. Defensively, it was another story. Calgary had the worst GA/GP (3.13) in the entire NHL last season. The Columbus Blue Jackets were the only other team to allow over three goals per game. Combine that with the Calgary’s NHL-worst penalty-killing percentage and it doesn’t speak volumes for the defensive capabilities. The reality is, when your top three defensemen play the most minutes and get the credit for the good, they take the hits for the bad. That said, the Flames defense does deserve a bit of leeway in that Calgary’s goaltending was a real concern. While the Flames goals against average proved to be the worst in the league, their shots against ranked 20th which is a huge discrepancy. 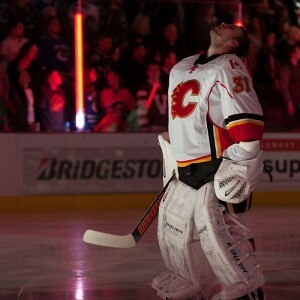 The sheer amount of goals allowed by the Flames can’t be laid squarely upon the shoulders of Calgary’s blue line as their netminders clearly were not keeping up their end of the bargain. Hence, the Flames did an entire 180-degree turn in net this summer. 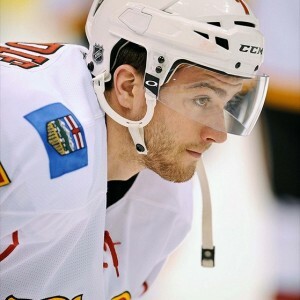 We can see in terms of cap hit, the Flames were third highest among the 11 teams listed. Calgary is paying a premium for their offensive production. In fairness, one key to remember is that cap hits and salaries are not the same in the NHL. Some of these teams have players on favorable cap hit contracts while being paid a lot more money in terms of salary. Entry-level deals and buried bonuses will throw these numbers off a bit in either direction. There are also the anomaly teams like the Arizona Coyotes. The Coyotes were able to get 108 points out of around $7 million combined salary for their three top-producing defensemen. This is pretty amazing and also very rare. It’s possible, but not likely that a team like Arizona will sustain that kind of production without dramatically having to bump player salaries. We can see Calgary’s cap hit for their big three in 2015-16 was $14.42 million. Comparatively, it was a hefty price to pay, but to determine value, we need to know what the extra production is worth in terms of dollars and cents and that can be difficult to assess. Two teams paid more than the Calgary Flames, that being the Los Angeles Kings and the Chicago Blackhawks. Neither got more offense (22 and 28 points less respectively) but significantly better defense. Eight teams paid less than the Flames and only one got better offensive production (Nashville). Ottawa and San Jose were right on par points wise, separated by only a small amount of money. Like Calgary, Ottawa wasn’t very good at keeping the puck out of their net, while the Sharks were top ten in that category. The other teams were both smaller cap hit teams combined with a great deal less production offensively. Of those eight teams, only St. Louis was in the top five of NHL teams in GA/GP. Looking at it with this type of examination, San Jose was the class of the league. They produced a good combined top-ten defense with 137 points from their blue line on offense. They paid slightly above average to obtain that production, but the results and where they finished in the playoffs last year should provide evidence it was a good combination. If we use San Jose as the benchmark; Calgary got better offense but paid more for it. In the end, we can consider it offensively comparable. The biggest difference is the defense, where the Flames were outclassed by the Sharks. San Jose was second lowest in shots-allowed and top-ten best in goals-against. Calgary didn’t come close. If Calgary wants similar results in 2016-17 to the 2015-16 Sharks, the real test will come this year when Calgary is able to reassess their goaltending and combine it with their defense. Offensively, the Flames three best defensemen should continue to be strong and among the NHL teams leaders; but if the new combination of netminding and defense isn’t enough to move the Flames from the bottom of the pile in terms of goals-against, Calgary may need to consider a change. A repeat poor performance on defense means the goaltending can’t be labeled as a scapegoat. Calgary still needs to find depth on defense and with forwards receiving big pay raises this summer, Calgary management may have some tough decisions on the horizon.